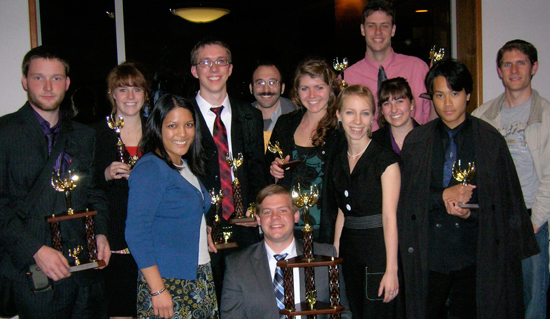 Biola has fielded a competitive speech and debate team since 1955. Over the years, Biola student competitors have won more than 5,000 individual and team awards in both debate and individual speaking events. Students from Biola University have been honored by local, regional, and national awards. The American Forensic Association National Individual Events Tournament lists several Biola students as national champions in various events. To find out how to join the Forensics Team or for further information, please contact Daniel Elliott at 562.944.0351 x5588 or daniel.a.elliott@biola.edu. A Forensics scholarship is offered by the Communication Studies Department. Deadline to apply for 2017/18: March 31, 2017. Applications after the deadline will be considered if there is scholarship monies still available. For scholarship information, email Professor Daniel Elliott at daniel.a.elliot@biola.edu. Please congratulate these students as well as McKenna Patton, Daniel Monroe and Reagan Smalley for their assistance in prep time. The support of the whole team really helped us tremendously. We should also thank Eric Garcia, our debate coach who was phenomenal in his instruction, enthusiasm and coaching of our teams to victory.